BookPeople is proud to partner with the Austin American-Statesman for their monthly Statesman Selects program. Each month, BookPeople will highlight the Statesman‘s top recommended read for Austin. 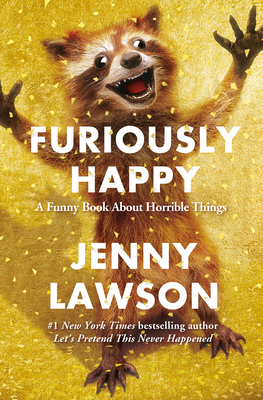 September’s pick is Furiously Happy by Jenny Lawson. Come down to the store Wednesday, September 23 at 7PM when Lawson will be speaking and signing her new book in our store. Pick up a copy of the Statesman on Sunday, September 20 to read their review of Furiously Happy. STATESMAN SELECTS: BOUND TO BE A GOOD READ. Jenny Lawson, also known as the Bloggess has been blogging about her life for near a decade highlighting with brutal honesty and dark, strange humor the truths of mental illness that she has lived with. Born in Wall, Texas, Lawson strove to fit in growing up but found it difficult with her taxidermist father and an exceedingly eccentric childhood. Her first book, Let’s Pretend this Never Happened was released in 2012 and introduced those not following her blog to her wacky life and personal history. We are very excited to have Jenny Lawson here at BookPeople on Wednesday, September 23 at 7pm. If you can’t make it, you can pre-order signed, personalized copies of Furiously Happy now. (We ship worldwide.) Come on over to Book People and hear what she has to say and get your book signed. It’ll be awesome! We love Jenny Lawson! P. P. S. Check out her blog.